For most amputees, the road to a more fun recreactional prosthetic device is slow and costly. However, thanks to a student-led research group at the University of Illinois at Urbana-Champaign, that might be changing, which is especially good news for those who are most in need, residents of the developing world. The students have created one of the first 3D-printed prosthetic hands with pattern recognition capability. A machine-learning algorithm allows it to do more than just open and close. It learns other positions of the hand for more functionality. Just as importantly, it can be created for a mere $270 compared to the average myoelectric prosthetic, which retails for between $30,000-$40,000. Even taking in consideration mark-up, it still represents a significant cost decrease to the patient. "Using the machine-learning algorithm based off the signals it picks up from the muscles, it can figure out which of these grips he is actually doing," explained team leader Aadeel Akhtar, an MD/PhD candidate in neuroscience from the College of Medicine at Urbana-Champaign. "The microcontroller with the machine-learning algorithm will then replicate the grip he's trying to make. Based on those signals, it sends commands to motor drivers, which churn the motor and make the hand move." Although the EMG board that is being used for the current prototype is the size of a standard audio mixing board, it will eventually shrink to a size that can fit into the socket of a residual limb. Akhtar's team has created a mathematical model of five actions – a hand at-rest, open-faced, closed (tool grip), a three-finger grasp, and a fine pinch. The initial training takes about one to two minutes and involves a patient going through each one of the gestures. In August 2014, Akhtar and Mary Nguyen, a master's student in aerospace engineering, traveled to South America. They put their latest creation, an open-source dexterous artificial hand, to the test on an Ecuadorian man. "The goal of the trip was to get it to work with a patient," Akhtar said. "Although it took some debugging, we were successful." Akhtar, Nguyen, and six other engineering undergraduate students operate out of the research group advised by Tim Bretl, an associate professor in aerospace engineering who specializes in robotics and neuroscience. 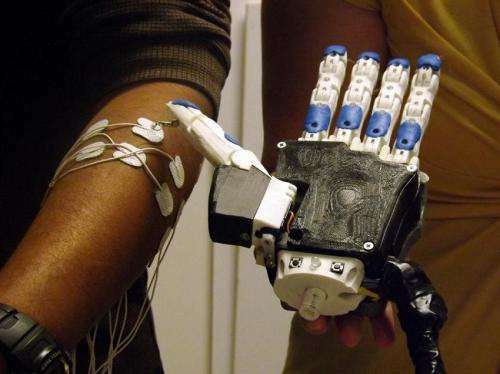 The group has been conducting research on electromyographic (EMG) control of prosthetics and sensory feedback for the past three years, but it was the use of 3D-printing to create the model moved things along at a faster rate. A connection last spring with David Krupa, an Illinois alumnus, accelerated the project even more. Krupa co-founded the Range of Motion Project, a non-profit organization in Guatemala and Ecuador that provides prosthetic and orthotics to those without access to rehabilitative care. After hearing about its work, Krupa approached the U.S. embassy in Ecuador about sponsoring team members in travel to Ecuador to test the device on a patient. The hand itself takes about 30 hours to print, then another two hours to assemble. All the electronics that are necessary to convert the neural signals into movements are located within the hand. This semester the team is working on the third iteration of their design in which the palm will be thinner and the fingers stronger. They plan to return to Ecuador in early January to leave it for a patient, and the group has even bigger plans for future iterations of the device. "No commercial prosthetic device has any sort of feedback," Akhtar said. "We're going to put sensors in the fingers. Based on the amount of force that the fingertips are detecting, we are going to send a proportional amount of electrical current across your skin to stimulate your sensory nerves. By stimulating your sensory nerves in different ways with different amounts of current, we can make it feel like vibration, tingling, pain, or pressure." Through a mechanical connection from one of the artificial fingers directly to the skin, the patient will also be able to better feel the position of their hand without looking at it. "We did some initial experiments in the lab and found that with only six minutes of training, users could distinguish between six different grips with 88 percent accuracy without looking. With that kind of result, image how well someone could operate it in even a week's time." "It's really awesome to be able to help people," Nguyen aid. "I didn't imagine doing something that has this direct impact on the world while still in college." This is for kids. I think the idea is that it will remove some of the negative stigma from the kids with amputaions.